The iPhone XR uses the same processor as the iPhone XS and iPhone XS Max, as well as Face ID and the TrueDepth camera, but uses different display technology and a single rear camera. Its sides are also made out of aluminum, rather than stainless steel. The phone is larger than the iPhone X, with a 6.1-inch LCD display. It retains the TrueDepth camera that first launched on the 2017 iPhone X, and says goodbye to the Home button. Apple has some new color options for its mainstream iPhone. 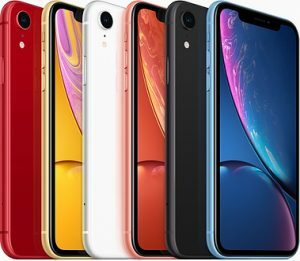 While past models have been available in up to three colors, this year, Apple is offering the iPhone XR in six: Black, White, Product(Red), Yellow, Coral, and Blue. However the most attractive point in this phone is the price point which is much less at starting price then its counterparts. Where: The iPhone Xr is available at Sprint, Verizon and AT&T and T-Mobile, Apple Stores and online, Best Buy Mobile and some major retailers. Who: This phone would be perfect for someone who needs to upgrade their current device. Or if you want to give your teen the latest device without the high price point.